Orthodontics (from greek orthos “straight or proper”; and odous “tooth”) is a specialty of dentistry which is concerned with the study and treatment of malocclusions (improper bites), which may be a result of tooth irregularity, disproportionate jaw relationships, or both. Orthodontic treatment can focus on crowded and crooked teeth only, or can deal with the control and modification of facial growth. The American Association of Orthodontics now recommends that children get an orthodontic assessment at no later than age 7. While orthodontic treatment can be carried out at any age, timely treatment ensures maximum dental health. With all of the latest advancements in orthodontics, wearing braces has never been easier. State-of-the-art appliances and treatments are now available, from traditional metal braces, to clear and tooth colored brackets, to NASA type wires which are heat activated and require fewer adjustments! Some patients may even be candidates for treatment with Invisalign braces, a revolutionary way to straighten teeth using clear, retainer type aligners that require no braces or wires whatsoever! Please contact us if you’d like to find our more information or to arrange an appointment. Indicators for Orthodontic treatment to look out for? 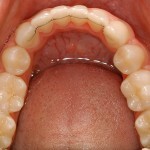 Crowded or teeth which overlap. teeth. As the wires move they move the teeth with very gentle pressure into a better postion. 40s and 50s. Senior citizens are also in treatment at the practice. Is it important to see a general dentist whilst I have my braces on? see your general dentist for a dental check up every 6 months during Orthodontic treatment. Can I play sports with my brace? protect your teeth and brace. will be given advise on the day that your brace is placed which will be specific to you. will provide products which will help with this on the day that you get your brace placement. We will give you detailed advice on the day that you get your brace.